Atsushi, despite his history and penchant for weapons of war, maintains a boyish, youthful appearance , married with well-fitted suits and Kemurigakure robes. He's quite small in stature, with a lithe, lean build. In his capacity as a weapons developer for Kemurigakure, he'll don professional attire consisting of a suit or jacket, or dress-shirt with a vest and black trousers with black knee high boots. Around his waist he'll wear a segmented belt with the Kemurigakure headplate worked into its design. For colder weather he'll don a thicker pea-coat and gloves. The more pockets for hidden devices the better, and its a fair assumption he is never unarmed, with seals even hidden in sleeves. On the field, Atsushi prefers to wear a hooded robe, with pockets woven into the interior fabric to hide scrolls, weapons, and small puppets. Beneath this he'll don similar black trousers and black boots, with a haori and mesh shirt. For ease of access, his items are clipped to a pair of belts, stowed in a pouch or pocket for quick retrieval via chakra string. Rumor has it that Atsushi has taken after his ground-breaking predecessors and fashioned his robes into a puppet, or that the fabric of the sleeves contains puppets. Practicing what he preaches, even Atsushi's clothing is a weapon. "Even the birth of a star and its planets is a violent, explosive one." Atsushi's future was cultivated early, in the humid, war ravaged Amegakure. The City of Rain, a long-standing haven for criminal organizations, and Shinobi fleeing the Five Nations, had become a melting pot of Shinobi culture over generations. Atsushi's parents, according to records, were descended from both Amegakure and the distant (And former) Land of Earth. According to Atsushi, his childhood was one of constant volatility, between external pressures from the Land of Rain, and his parents' unhappy marriage. Atsushi dreamed of a world free of the chaos, of the violence, and relished the deafening silence that followed the thunderclaps of the storms. The quiet that he desired was something he knew could only be achieved through force. Raised in Amegakure since birth, Atsushi grew accustomed to the constant downpours and the twisted city of metal and glass that crawled with criminals of all types. Years of conflict pooled within him, and as his parents became increasingly oppressive, even abusive as money and food became scarce. This is where Atsushi's history becomes difficult to trace; What is known is that Atsushi was eventually sold for drinking money to the Pipeline Lords of Block 16. Under the direction of Block 16, all of Atsushi's anger and loathing towards his parents manifested as the Blast Release nature affinity, and through a woman named "Yuzuru", the puppeteer crimelord, he learned to harness its raw destructive potential. Atsushi quickly proved to be a natural, a prodigy by some standards; explosive and dangerous but uncontrollable and arrogant. His proficiency in the art only grew in the Shinobi Underground, fighting on behalf of Yuzuru in highly illegal tournaments. Yuzuru the Crane, as she was known to ANBU units once belonged to the Hidden Sand, and hailed from the Chikamatsu Family. A prolific arms dealer and designer, her works had supported countless conflicts for several decades, with her weaponry responsible for fueling uprisings and toppling dynasties. It was no mistake that she saw her legacy carried on in the hands of Atsushi Keimusho. Through er her tutelage, Atsushi certainly cultivated the knowledge and technique necessary for designing world-class puppets and weaponry. More impressive still, Yuzuru commented that "Atsushi understands explosives, and their reactions as intimately as one might breathe". However, she failed to anticipate that Atsushi had grander ambitions than working in the criminal underground. Amidst a torrential downpour that scoured the city in lightning, Atsushi turned his latest creation towards Yuzuru, and his future allegiance to Amegakure and the Land of Rain. In the ensuing years, Atsushi Keimusho would lend his expertise to the various factions surrounding Amegakure, its government, and the neighboring Otogakure with the Land of Rice. He worked to stoke the conflict from Amegakure's side, sabotaging arms shipments with carefully crafted explosives, all of it in a desperate, if foolhardy, attempt to see the bloodshed end. It was here that he inevitably found allies within the Land of Rice and assisted in the late Otokage's conquering of the Land of Rain, providing some of the resources necessary to facilitate it. Under the rule of Uchiha Saizo, Atsushi's took on a much more mundane role, working closely with the administration as a quote "badass secretary" for Uchiha Saizo, the Kemurikage and consultant on weapons development. He essentially served as the "Mechanical Courturier" for the Kemurikage's administration. In the aftermath of the war, the newly christened Kemurigakure would become Atsushi's new homeland where he would lend his talents to Kemuri's military and leadership, blending weaponry from former Land of Rice. Vowing to never allow conflict to reign over the region, he has sworn allegiance to the Abyss Watchers, working with the group to develop armaments and defenses. Perhaps its the Bakuton blood running through him, and a piece of the Chikamatsu clan's influence, but Atsushi Keimusho first and foremost considers himself to be an artist; like the famous Bakuton and Puppetmasters of old, and that his work to be an expression of his talent. Atsushi believes in simplicity and minimalism in all things, and that too much complexity and over-engineering, makes a design cumbersome. Shinobi aesthetic should be simplified, with a "less is more" approach to all things, and this methodology is evident throughout Atsushi's entire persona. From his clothes, to his furniture, to his weaponry and ninjutsu, Atsushi cannot stand visual and technical clutter. Everything, he says, must have a utilitarian purpose. Otherwise, it is simply fat that must be trimmed. Likewise, he believes nothing should be wasted, and only when it has fully outlived its purpose should it be discarded, and even then its final moment should have a purpose. Too much complexity, filler as it could be called, and the artist's creation, the true meaning is lost in communication. Atsushi, despite possessing a lethal bloodline lineage, and working as an arms manufacturer truly detests violence and conflict. Like his artistic aesthetic, his weaponry is effective, to-the-point, and absolutely lethal in all aspects. He does not wish conflict to linger, and prefer for it to end immediately without hesitation. At heart, he is paradoxically, a pacifist, preferring peace. However his methods to achieving it are ultimately flawed, and misguided. On a lighter side, Atsushi's internal pacifism has drawn him to use violence only when needed. Atsushi, for his prolific artistry, is quite the coffee addict and yearns to sample the coffees of the world. His apartment in Kemurigakure is supposedly chocked full of such samples. He claims that he has spent so much of his adult life fully caffienated from sun-up to sun-down with his work schedule that he has forgotten how to function without the stuff. He can usually be found with a fresh cup. With all that coffee, the energy has to go somewhere. Atsushi is a fidgety, playing with doodads, paperclips, or sketching if he needs to occupy himself. Coffee Addict; indulges frequently and dreams of sampling the coffees of the world. Believes tea is "pompous water", and energy drinks to be a mockery. Atsushi "bats for the same team", and is immune to the Double D-Cup witchcraft of the world. Unabashed perfectionist, with a smoldering temper. Hates the rain. Its watery, and it gets everywhere. Kugutsu Specialists can understand, learn, and use kugutsu (and, by way of a knowledge of mechanics, bukijutsu that function as a part of or through their puppets). They are automatically trained in the Chakra Threads technique and the Puppet Technique. They possess a puppet whose total value cannot exceed 200,000 ryō, and a budget for repairs of their puppets that can be used upon entering a village of the same amount (unless that village is hostile to the character). They receive a tier to their Coordination while using kugutsu. Kugutsu Specialists are taught to experiment with poison for application to the hidden traps and weapons of their puppets, allowing them the ability to craft Journeyman-level poisons. They are experienced at setting traps and launching surprise attacks, and function best in conditions where they are best-primed to abuse their opponents' lack of information; a Kugutsu Specialist's opponents' Wisdom is treated as a tier lower for the purposes of avoiding their hidden traps and weapons. They can create up to S-Rank puppets and customs for kugutsu. Ninjutsu Experts can understand, learn, and use ninjutsu. They use half as many hand seals as would otherwise be required for all techniques (which may reduce the number of required hand seals to zero). Ninjutsu of a chosen element are treated as a rank more powerful (up to a maximum of S-Rank; if an Attribute-boosting technique has its power increased in this manner, its returns also diminish at a Minor Advantage less per tier). Ninjutsu Experts receive a Major Advantage to their Coordination for the purposes of aiming, and can perform hand seals as if the Attribute used were a Major Advantage higher for all techniques. Ninjutsu Experts may select a technique that they know, and permanently reduce the number of hand seals required to use it to one (this reduction does not stack with any other reduction). Ninjutsu Experts receive a pool of 60 Stamina Points that may only be spent on ninjutsu. They can create up to S-Rank customs for ninjutsu. Fūinjutsu Novices can understand, learn, and use fūinjutsu. They are automatically trained in the Enclosing Technique and the Unsealing Technique, and receive a scroll which, if lost, they can replace upon entering a village (unless that village is hostile to the character). Fūinjutsu Novices can create up to B-Rank customs for fūinjutsu. Genjutsu Novices can understand, learn, and use genjutsu. They may bypass the requirement to state the use of D-Rank genjutsu, and may pierce genjutsu of C-Rank and below without the use of Genjutsu Kai's hand seal (though they still have to expend the Stamina). Genjutsu Novices can create up to B-Rank customs for genjutsu. Live Fire || Starts with a Resonating Echo Speaker (Melody Gauntlet) for the purpose of live sound jutsu field tests for Kemurigakure's military and research division. 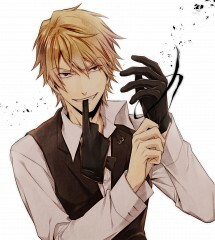 Mechanical Courturier || Atsushi reportedly understands mechanics and explosives as innately as one might breathe. Given his bloodline lineage, he may replicate /produce a previously registered device, puppet, or weapon of his choice (and design) for an equivalent exchange of chakra, +1 rank, composed of Steel Release-produced alloys. Can be applied to similar items acquired from enemies or allies, but not in the same thread as they were acquired. Overdue Receipt || Atsushi begins with a -125,000 debt owed specifically to the R&D department of Kemurigakure. This is my character's custom item thread. Kugutsu Specialist: Kugutsu Specialists can understand, learn, and use kugutsu (and, by way of a knowledge of mechanics, bukijutsu that function as a part of or through their puppets). They are automatically trained in the Chakra Threads technique and the Puppet Technique. They possess a puppet whose total value cannot exceed 200,000 ryō, and a budget for repairs of their puppets that can be used upon entering a village of the same amount (unless that village is hostile to the character). They receive a tier to their Coordination while using kugutsu. Kugutsu Specialists are taught to experiment with poison for application to the hidden traps and weapons of their puppets, allowing them the ability to craft Journeyman-level poisons. They are experienced at setting traps and launching surprise attacks, and function best in conditions where they are best-primed to abuse their opponents' lack of information; a Kugutsu Specialist's opponents' Wisdom is treated as a tier lower for the purposes of avoiding their hidden traps and weapons. They can create up to S-Rank puppets and customs for kugutsu. Ninjutsu Expert: Ninjutsu Experts can understand, learn, and use ninjutsu. They use half as many hand seals as would otherwise be required for all techniques (which may reduce the number of required hand seals to zero). Ninjutsu of a chosen element are treated as a rank more powerful (up to a maximum of S-Rank; if an Attribute-boosting technique has its power increased in this manner, its returns also diminish at a Minor Advantage less per tier). Ninjutsu Experts receive a Major Advantage to their Coordination for the purposes of aiming, and can perform hand seals as if the Attribute used were a Major Advantage higher for all techniques. Ninjutsu Experts may select a technique that they know, and permanently reduce the number of hand seals required to use it to one (this reduction does not stack with any other reduction). Ninjutsu Experts receive a pool of 60 Stamina Points that may only be spent on ninjutsu. They can create up to S-Rank customs for ninjutsu. This is my character's custom technique thread. Mechanical Courtier || Atsushi reportedly understands mechanics and explosives as innately as one might breathe. Given his bloodline lineage, he may replicate /produce a previously registered device, puppet, or weapon of his choice (and design) for an equivalent exchange of chakra, +1 rank, composed of Steel Release-produced alloys. Can be applied to similar items acquired from enemies or allies, but not in the same thread as they were acquired. Last edited by Tungsten on Fri Feb 08, 2019 11:18 pm, edited 6 times in total. Description: Holiday Bonus (250) plus Birthday Bonus (29 * 10 =290) = +540? Last edited by Tungsten on Sat Dec 29, 2018 1:57 am, edited 2 times in total. Don't forget to update your totals. Description: Switching Genjutsu Novice to Taijutsu Novice; Storyline cohesion and build synergy. No Genjutsu techs registered or used by Atsushi. Description: Purchasing "Shussebora" for 200,000 Ryo, with the Kugutsu Specialist budget. Last edited by Tungsten on Wed Feb 06, 2019 10:43 pm, edited 2 times in total. Good, now eat your vegetables. Novice: Bukijutsu MoO Novices can understand, learn, and use techniques for one type of weapon (which cannot be bows, firearms, puppets, or swords); the type is selected at the time that the Novice rank in the Bukijutsu Skill is acquired. They possess a budget of 15,000 ryō for weapons of their selected type, which they may use to make purchases from another character. Bukijutsu MoO Novices can create up to B-Rank custom bukijutsu techniques for their chosen weapon type..
Could this apply to Atsushi's prolific use and understanding of explosives in combat? I don't know what it would look like, but I figured there could be a "fighting style" around them if various characters in media use them just as prolifically as Atsushi. Description: Secret CP, 150 CP.